More skywriting over Los Angeles on Monday. Performance artist Shia LaBeouf has added more to the sky-writing portion of his CV. 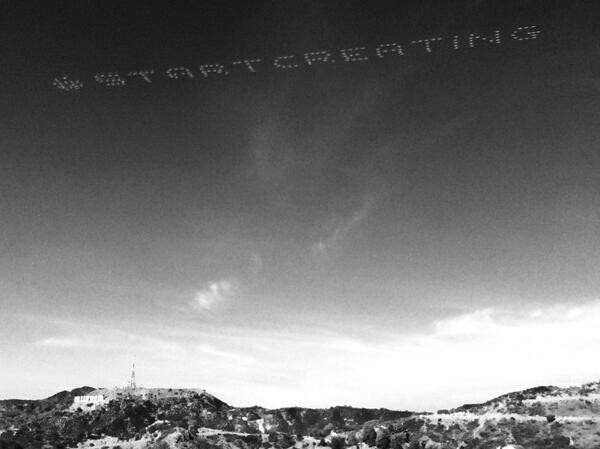 On the Presidents' Day holiday, people on the Eastside of Los Angeles were able to see a plane spell out the words "START CREATING." It's the latest in LaBeouf's recent run of odd public acts, which escalated in December when it was revealed that the actor had plagiarized the artist Daniel Clowes in a short film. Ever since, his attention-getting antics have veered from meta-apologies to Clowes — which have been themselves plagiarized — and ruminations on fame. Last week, he set up a gallery space in which he sat all day with a bag over his head that said "I AM NOT FAMOUS ANYMORE." It was open to the public, who flocked to see him. Monday's message was not LaBeouf's first turn at the skywriting rodeo. He apologized to Clowes via jet writing earlier this year. Soon after, he delivered the edict "STOP CREATING," also by air — it was a reference to the cease-and-desist letter Clowes' lawyer had sent him. As was Monday's opposite message. LaBeouf tweeted his own photograph to acknowledge his authorship.